I won't be using this activity until the Sunday AFTER Easter (that's when our ward is "celebrating" per se in Sacrament meeting). I think it's because our fast Sunday is the week before conference. I posted this early for those who want to do an Easter themed singing time the week before conference. The week before Easter I'll be doing a General Conference activity that I do every year found HERE. I'm using the week to take a break from program songs for the month! Okay, back to the Easter lesson...sorry for the tangents! If you'll notice, I just added a Primary song to each picture circle that relates to each number. Just do as the instructions say in the upper lefthand corner but include singing the song in between each one. I decided to send this to Costco as a 20x30 lustre photo which was $9.99. If you decide to go the same route, use this JPEG image HERE. I also have one without the songs HERE if you want to choose different songs or not sing at all (maybe you want to do this for sharing time instead). To pick my songs I simply looked up correlating topics in the back of the songbook - pretty easy. Make sure you download from these links and not right click on the image above for better resolution quality. If you'd rather print this at home, I've "tiled" this poster as well. I'd recommend printing on card stock for durability. Find the one with songs on it HERE and the blank one HERE. What's great about this, is it can be used EVERY Easter, so well worth the effort!! You can also find more of my Easter singing time lesson plan posts HERE (one of them is a similar activity using the Friend from a few years ago). Match up the pictures with the same verbiage in the activity...I even typed it up - find it HERE. You could do a matching game...place everything out of order on the chalkboard and the kids get to match it all up by drawing a line with chalk. Easy! 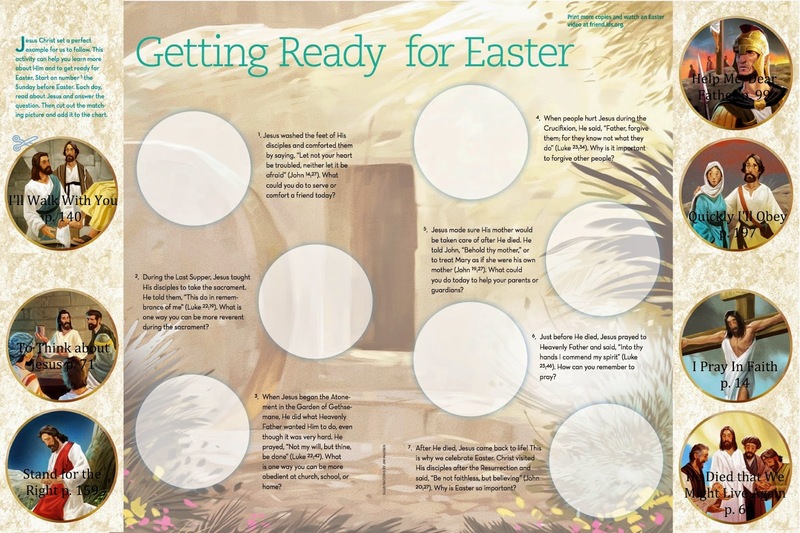 If you HAPPEN to need an Easter lesson plan to fill the full 5th Sunday hour, I'd recommend this activity, then pulling out the handbells and finishing up with the song Hosanna. Find my lesson plan, complete with bell charts HERE. Never used the bells in primary? See my post HERE! This is brilliant! I am looking forward to using this, thank you for putting sharing your efforts. Thanks so much! This Easter singing time looks perfect and I love that it's adapted from the Friend. You are amazing. I am not sure if this is just a problem with my computer, but I keep trying to print the tiled picture and it prints 2 copies of the 1st 3 pages but won't print the last 3. Any ideas? Thanks for the great lesson plan! Anita, if you contact me using the "contact me" tab above, I'll get your email address and send you the file that way. I haven't used this lesson plan yet but I did print the poster at costco and will cut out the circles, maybe even glue them to some thicker backing...not sure. Then I will have a child or a class pick the matches. Thank you Camille! I use SO MANY of your ideas regularly and love your creative fun ideas. Thank you for sharing everything and making it so easy!!!! I uploaded the image to Costco. I have everything ready to go but it is saying the image is low resolution. Is there something I need to do to resolve that? I don't want to order the print and have it be blurry. Thanks for sharing all your hard work with us! Sorry for the delay in responding - I've updated the JPEG images so they are bigger files and shouldn't give you the low resolution warning. I did originally have it printed with the smaller file and it printed fine but now there will be no need to worry. Let me know if you have any trouble.